If you like to freezer cook minus the meat, you are in the right place! 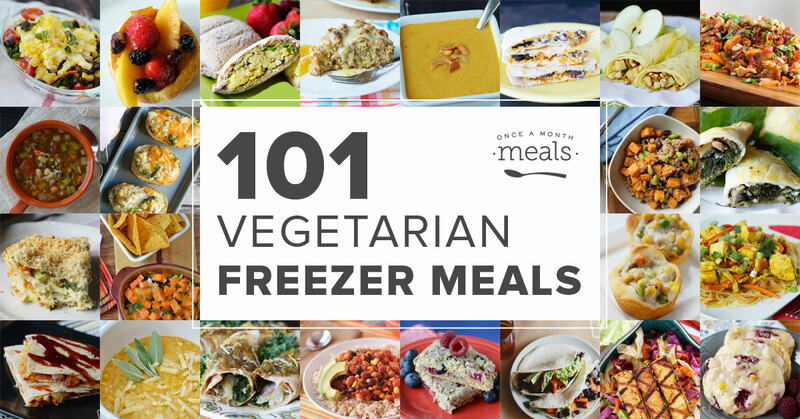 We have 101 Vegetarian Freezer Meals to help stock the freezer and balance the budget. All Vegetarian Recipes! All Vegetarian Menus! Learn how to create your own custom menu from these recipes using our Membership. (*) Next to a recipe indicates that you can ACCESS NOW without a paid membership. These recipes are wonderful and a great help; however, the color orange is very difficult to read. You might put it in BOLD to make it easier on the eye. Oh we are so sorry it’s been difficult for you to read! We will pass that along to our Product and Design team for review. Thank you so much for the feedback Maggie! Thank you so much for posting, I’ve been searching for and experimenting with freezer meals forever. It’s the easiest way to dtay healthy even on busy nights. This list helped immensely. Thank you so much for posting vegetarian meals! I just recently learned about freezer cooking but having a hard time finding delicious flavorful vegetarian freezer meals. Thank you! Oh great Michelle – glad to hear this is helpful for you. Happy Cooking! OMG this is what I’ve been searching for!!!! Thank you for creating it! Thank you so much! I am a full time working mom with 4 young kids, struggling to avoid the fast food window on weeknights. I’ve been searching for kid friendly vegetarian freezer meals for so long, and have been coming up short-my kids don’t have the palate yet for a meal consisting entirely of chickpeas or black beans etc. I stumbled across this treasure trove today in yet another search for make ahead meals for my family, and I’m so excited to get started on my meal prepping! That is wonderful Elizabeth! So thankful you found us! Please let us know if there is anything we can assist you with! I tried to access a recipe and was asked to log in or register to access. Then found that the list is full and there is a waiting list. Not impressed. We’re very sorry to hear you feel this way. To continue to focus on our community and core values, we implemented a new enrollment process where we will only accept new members during select times throughout the year. We want to focus on our current members, build community, and love on our members in new ways. We would love for you to join us during our next open window of enrollment! Joining the waitlist will ensure you receive priority notification.